Could I possibly owe the Atlanta Hawks an apology? Well, not yet. But this Eastern Conference semifinals series with Sunday’s 100-88 Hawks win over the Bulls is a lot closer than the sweep I had predicted. And seemingly that’s not so certain for the Bulls anymore even with the Bulls having two of a possible next three at home with the series now tied 2-2. So we get to see as the clichés go who wants it more, is tougher and tries to avoid that back to the wall thing. But this time, apparently as shocking to me as it was to the Bulls, the Hawks were not only quicker, as they can be with their world class athletes, but they were smarter than the Bulls. I assumed that never would occur. But they moved the ball against the Bulls shows and double teams, and it was the Bulls, particularly Boozer and Joakim Noah, caught out of position late and leaving the basket unprotected as the Hawks closed with a 16-4 run over the last 4:31 after the game as tied at 84. Rose had 34 points and 10 assists, but on 12 of 32 shooting as the Hawks did a much better job on Rose—actually some job at all for the first time in this series—with a hard trap off the pick and roll early, then playing the taller Joe Johnson on him with their big men flater ading into the paint to put up a wall at the basket. Rose, typically, blamed himself for the loss because of a pair of turnovers just after that tie at 84. Some will say Rose shot too much and veered too far from the offense. Which Bulls coach Tom Thibodeau laughed at, and I agree. Look, this is how the Bulls got this far, and Thibodeau is a “dance with who brung ya” coach. Keith Bogans isn’t being replaced, and Thibodeau is going with his rotations and finishing with Boozer and Kyle Korver, which he did all season. Yes, Taj Gibson was very active and very good in nine fist half minutes with four blocks and seven points, though he only played early in the fourth quarter until being replaced by Boozer with six minutes left. 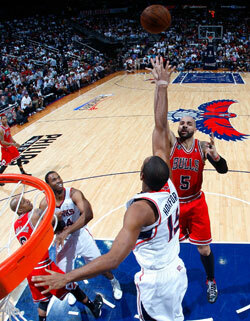 Boozer had his best game of the playoffs with 18 points and six rebounds on seven of 10 shooting. But he was scoreless with just one shot in the fourth quarter. Korver had a tough night with two points on one of eight shooting and struggled down the stretch trying to match up with Hawks speedy guard Jeff Teague. But with the Hawks playing Jamal Crawford and Joe Johnson along with Josh Smith and Al Horford in that stretch, there was no favorable defensive matchup for Korver. Still, the Bulls success all season was using Korver down the stretch both to shoot but also spread the court for Rose’s drives. It just didn’t work this time. “He’s (Rose) making plays and scoring and everyone says how great he is,” Thibodeau said with a laugh at the obvious irony of the view when the team loses. “He was aggressive. I didn’t have a problem with the way he played. That’s the great thing about him. He’ll be ready for the next one. “I’m anxious to see the replays,” said Thibodeau. “From my perspective he was getting fouled. Maybe he was not going hard enough. 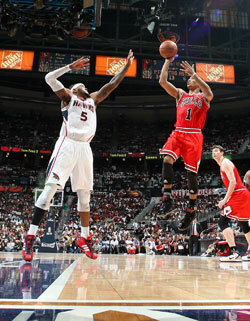 There was a crucial no call when Rose drove between those two turnovers with the Hawks ahead 88-84 with 3:37 left. Al Horford went straight up and sometimes you won’t get a call even in the paint when a defender does that despite contact. It’s an area where the NBA is trying to differentiate fouls. But the Bulls did get an official bad call with 2:27 left and trailing 90-84 when Rose faked Crawford into the air and he came down on Rose. It should have been three shots, but veteran referee Bennett Salvatore called an inadvertent whistle, which meant a jump ball. The Bulls lost the jump when Smith beat Noah to the ball. Thibodeau also made his own late mistake with a timeout he didn’t have and Chris Webber didn’t ask him to take that cost a technical foul. But the game was long decided by then. Yes, that could have brought the game within three, one possession as they love to say on TV. But it was the Bulls defense which failed repeatedly down the stretch as the Hawks finished shooting 49.4 percent led by Johnson with 24, Horford with 20 and Smith with a monster effort of 23 points, 16 rebounds and eight assists. Smith was gracious in the interview room after the game, but when he came off the court and was interviewed by the TNT crew he did answer “No,” when asked whether the Bulls could beat the Hawks by relying on Rose. It’s not exactly great so called bulletin board material as it was hardly in context. But the Hawks finally did what the Pacers did in the first round to make it do difficult for the Bulls at times. They talked about playing physically and tougher against Rose, which I didn’t think they did. But they reacted to the Bulls doubles well, moving the ball and staying away from the isolations they so love. Smith did haul off a few long jumpers. But he went inside much more, where he was often too quick for the Bulls. Down the stretch when the Hawks pulled away it was especially evident. Korver had trouble with Teague, who beat him for an 86-84 lead, though there was no help at the rim. Rose then lost the ball dribbling into traffic as the Hawks were closing on him. Look, I’m with Thibodeau. The Bulls have ridden him in these spots all season. Sometimes it doesn’t work, but I’d take my chances. Plus, Korver was zero for five on threes and Luol Deng was one of six. They weren’t exactly running to the ball. Boozer had some nice post scores and jumpers, but the paint was getting awfully crowded. Should Boozer be going inside then? Noah? Horford got a nice handoff in the lane for a runner to make it 88-84 Hawks with 3:47 left, and then Rose drove and didn’t get that call against Horford. Rose then lost the ball dribbling between his legs, and then Horford did a terrific job sealing Rose on a switch as Noah and Boozer stepped up to contest Smith and Smith passed to Horford for the easy layup and 90-84 Atlanta lead with 2:41 left. Then came the inadvertent call and jump ball the Bulls lost, and the Hawks began to pull away. Noah stepped up again off Horford and Horford dunked on another pass from Smith with no real help coming across. Korver missed a very long three, and then Teague again blew by Korver with no one stepping in to stop him for a 94-84 Hawks lead with 1:26 left and that really was about it. It was a run of amazingly poor and indifferent reactions from a Bulls team that had been so sharp defensively for Games 2 and 3. Deng scored on a Rose pass, but Crawford then put in a long three with a minute left for an 11-point lead. Korver then got stripped on the next possession. The Bulls were attacking the rim early, getting a remarkable 13 free throws in the first quarter alone. Zaza Pachulia did get a flagrant foul late in the quarter against Gibson, but that was the only real questionable such action by the Hawks. They did go back to their taller lineup with Jason Collins at center, though he only played a bit less than 12 minutes. But Pachulia after playing 26 minutes in the first three games played 26 Sunday, and the size and obviously more energy and interest in the game from the Hawks negated the Bulls big rebounding edge. The Bulls outrebounded Atlanta only 37-36 while it was the Hawks with the second chance points edge at 15-10 and a 56-40 margin in points in the paint, categories the Bulls usually dominate when they win. When they don’t, it means they are being beaten to the boards, out of position on defense and taking too many jumpers. The Hawks took a 28-26 first quarter lead in their kind of game, higher scoring and faster and they had a 16-8 edge in fast break points. They also did a nice job shutting down the Bulls outlet passing that was brilliant in the Game 3 romp as they often sent a man back to interrupt Rose before he got into full stride when catching the ball and then retreating. That got the Bulls into a bit slower game, especially Rose. The Hawks trapped Rose constantly off the pick and roll in the first half and he was four of 11 shooting in the first half. The problem was Deng and Korver were a combined four of 16, so Rose’s outlets weren’t working and while Boozer was having some success, it was more in operating on jump shots without a lot of team movement. The Hawks led 47-46 at halftime behind Johnson’s 15 points as he eschewed the one on one game and did a better job scoring on the move. The Hawks had a dozen first half assists, far above their series average. Rose was still doing some amazing stuff, though one of my favorites was after a turnover early in the third he sprinted back to stop Teague on a breakaway and the Hawks pulled the ball back out and didn’t score. The Bulls tried Rose a few times coming off baseline screens and then attacking from the wing to lessen the effect of the traps on top. It began to work and Bogans, who came back from a sprained ankle, hit a three to keep the game tied late in the third. And then the Bulls closed strong with a pair of Boozer scores and Omer Asik dunking on a Rose pass when Rose was smothered on a drive. That gave the Bulls a 69-67 lead heading into the fourth quarter, a good situation on the road. But the Bulls seemed to run out of energy then. The Hawks converted three consecutive misses into offensive rebounds and scores. Rose was matching them by himself with a running floater and another, the latter for a three point play, and then blowing by Teague for a score and 76-73 Bulls lead with 9:36 left. But the Hawks kept the Bulls big men moving and Smith kept ducking inside for scores. Korver finally hit one to tie the game at 78, and then a Rose floater tied the game at 82 when the Hawks reverted to falling into the paint to show a wall of defenders to Rose instead of the trap to force the ball out of his hands. It seemed a strategy that would help the Bulls. But the Hawks were the ones to pull away and tie the series.